Mojo marinades, used in Latino and Caribbean cooking, are made with citrus juice, vinegar and spices for a light, tangy flavor. The Goya brand makes a line of mojo marinades for chicken, beef and pork dishes. In addition to a traditional green mojo marinade, Goya also carries mojo marinades with other flavor profiles, such as chipotle and bitter orange. 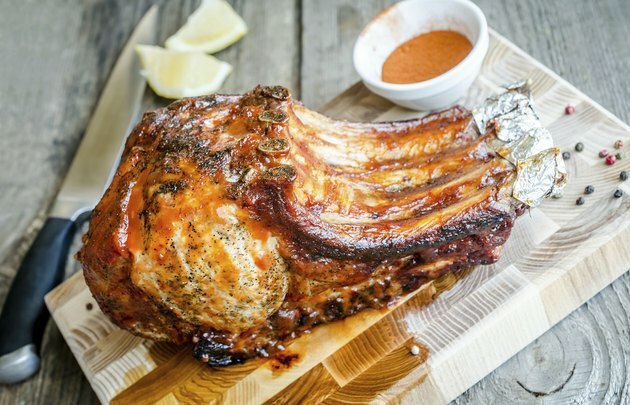 Use Goya marinades to enhance meats and vegetables for the grill in summer, in the oven in the spring and in the slow-cooker on cold winter days. Place your choice of meat, such as chicken, steak or pork, on a cutting board. Trim the excess fat from the meat with a boning or chef's knife. Include vegetables, such as peppers and onions, if you like. Pour the Goya Mojo marinade into a plastic storage bag, using roughly 1 cup of marinade for 1 to 2 pounds of meat or vegetables. You may also use a plastic storage container or a glass baking dish. Avoid aluminum baking dishes, because the acid in the Mojo marinade will react to aluminum and give the meat a metallic taste. Slide the meat into the plastic storage bag or container and seal it tightly. Turn the bag over several times carefully to evenly coat the meat. Set the plastic bag inside a large bowl to catch any spills or leaks that may occur while marinating. Cover the dish with plastic wrap or a tight-fitting lid. Place the dish into the refrigerator for three to eight hours. For a stronger flavor, allow the meat to marinate in the refrigerator overnight. Remove the meat or vegetables from the marinade and allow the excess marinade to drip off the pieces before cooking. Discard the used marinade. Baste the meat on the grill, in the oven or in the slow-cooker with fresh Goya Mojo marinade to really bring out the flavor.